I’m doing a humility experiment this October – want to join me? I know we’re not there yet, but let me sing October’s praises for a sec. It is just the BEST, firstly because it’s mid-spring in Sydney, which is always glorious and a little taster of heaven. I also have a significant birthday this October (yes, that’s code for ‘I’m turning 40’), my husband and I have our wedding anniversary, and it’s our eldest daughter’s feast day. There are 31 days in this month and when I was thinking of how I was going to make the most of every one of them this year it occurred to me that a great way would be to try to grow in a specific virtue. St Therese of Lisieux (Oct 1) who showed that the way to greatness is by doing the ordinary, everyday things with love and trust in God’s mercy. St Francis of Assisi (Oct 4) who loved poverty so much from his conversion to the moment of his death when he asked for permission to die naked upon the ground. Our Lady of the Rosary (Oct 7) who in her crystal-perfect humility called herself both the handmaid and the magnifier of the Lord. St Teresa of Avila (Oct 15) who said that humility and self-knowledge are necessary for holiness. If months can be thought to have a theme, then October should probably be the month of humility, and as it’s my month, I’d better learn something of it! Virtue, humility – they sound a little daggy. But I reckon that a good person, a virtuous person is more grounded, more open-minded, and happier too. For Christians, part of the job description is to keep growing in virtue until the day we die. And I know I’m not going to be able to do that without being at least a bit intentional about it. Notice the emphasis? God creates the great things out of us, we don’t create great things ourselves. But that’s not the way I tend to think day-to-day. I tend to want to achieve stuff, and get frustrated when I don’t or can’t achieve them. Then there goes my peace, because I have no humility. So next month I’m going to do a humility experiment – and will try to blog about it every day during the month. I’ll bookend it by going to the sacrament of reconciliation on October 1 and 31. Each day I will do something small (or refrain from doing something!) to consciously cultivate this virtue that so many of the saints and holy people of every world religion have so highly prized and which is so antithetical to our western culture. To start off, for example, I’ve pegged going to reconciliation for day one and practicing perfect obedience to the road rules for day two. Also each week I’ll be asking a different person, someone devoted to the life of faith, either a priest, religious or lay person, one thing that humility means to them, one thing it is not, and for their advice on how to develop this virtue. You have nooo ideeea how hard this is going to be for me, unless you’re my husband and then – no, still – you have nooo ideeea how hard this is going to be for me! You’re welcome to come along and do this experiment with me. In fact I would love the company – please come along and do it with me! I’ll post the challenge at the start of each day (AEST time) and then update in the evening with how mine panned out. Leave a comment on how you found the challenge, or if you have a blog you might like to write about it on your own blog and link back to mine in the comments so I can go and see your post. Of course if you want to join along you don’t have to do it every day, you could pick just one challenge/experiment for just one day, or any number of them for any number of days, and also, of course you don’t have to write anything at all! I don’t know if I will be any more humble at the end of the month – I don’t want to presume so, because that seems a bit prideful and thus counter-productive, but I have hope that God wants me to grow and has inspired me to do this challenge to that end! I guess though that even if I fail my own challenge/experiment – if I don’t even manage to get the things done or to blog about them every day – it will be a humbling experience. So I can’t really lose, right? 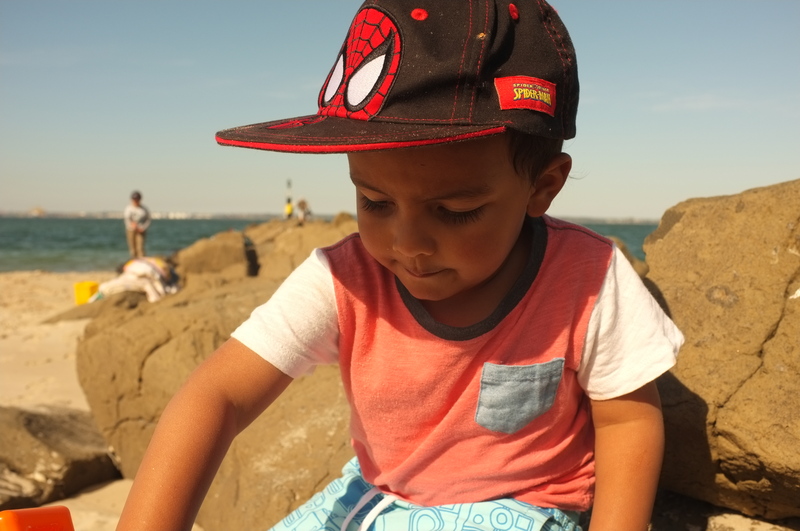 Photo: Our littlest boy last weekend at the beach. How awesome is it that it’s already warm enough to go to the beach! I’m in!!! Ok u know me I’ll probably do the first few skip a few…. Haha, well I might as well! How do I follow though? Oh Sinead! I had wanted to set something all up properly with a daily email and daily challenge and everything but was too ambitious and I haven’t been able to do it. But one of the daily challenges I had in mind was to practice submitting to legitimate authority, by perfectly following the road rules and best-practice driving when I’m driving around. Not as easy as it sounds! Then in the evening I was going to write up how it went and how it relates to humility, and invite others to comment as well on how they went and any reflections or thoughts. So shall we do that today?